CARE Nepal is an international humanitarian organization working in the country for the past 37 years. 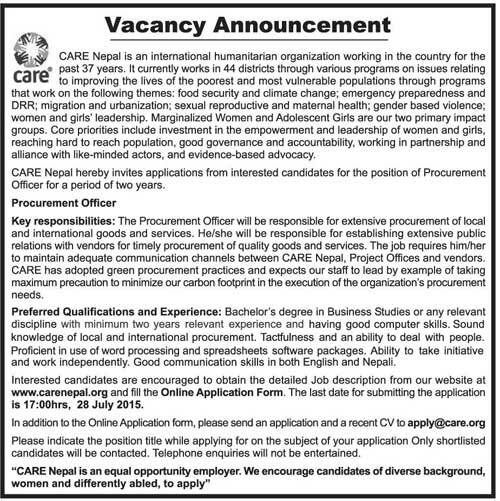 CARE Nepal invites applications from interested candidates for the position of Procurement Officer for a period of two years. Preferred Qualifications and Experience: Bachelor's degree in Business Studies or any relevant discipline with minimum two years relevant experience and having good computer skills. Sound knowledge of local and international procurement. Tactfulness and an ability to deal with people. Proficient in use of word processing and spreadsheets software packages. Ability to take initiative and work independently. Good communication skills in both English and Nepali.